Ctrl B will not save a new blueprint anymore. I can no longer save ANYTHING I create at all. I still have 60 GB left on my hard drive, so that's not the problem. I don't know which log file it means, so I attached those two. Now that I rewatched the stream, I saw that the exact same thing happened to xocliW as well! It seems to happen during the research quest for the blueprinting, after setting the blueprint. After finishing this stage, saving works again. I have seen this periodically on manual or auto saving. It always seems to happen when I try to Save As. I think that save name may be cause of this. Maybe length or spaces. 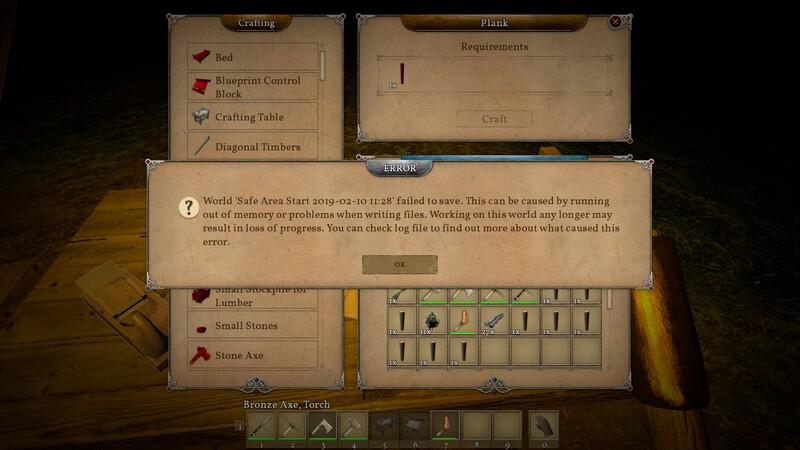 I had this problem to, so i shorter save name and second time save was ok. The new saves have a LOT of files. Literally thousands in some cases. Sometimes one of them decides to be stubborn. If it only happens once it's probably OK. If it happens more than once then we recommend using Save As to start a new save folder, or just exit the world and restore a working backup. We'll keep working to minimize save issues.